Skudo®Wave therefore reduces this vibratory effect that can cause a biological cell damage that occurs when the phone is in direct contact with the head (contact warned by many mobile manufacturers that, in the instruction booklet, explicitly indicate to keep the mobile phone at a certain distance from the body during the use). Specifically, when the phone is in contact with the head during the use, Skudo®Wave protects against the harmful biological effects generated by electromagnetic fields combined with the energy output of the battery inserted into the phone, without changing in any way the electromagnetic field of the phone, but by changing the spectrum of the vibrational bands of it, making more compatible the global electromagnetic effect that the mobile phone transfers to the user’s head. How do I check if Skudo®Wave really work? The acetylcholine test is an easy test that can also be performed also in absence of any instrumentation. The “disorder” caused by a mobile phone produces an evident reduction of acetylcholine at the wrist and acetylcholine is a neurotransmitter which also intervenes in the variation of the muscular tone. Skudo®wave has been scientifically tested? scientifically “in vivo”,(directly on man) and “in vitro” (in laboratory) about the effectiveness in transferring its protective properties to the material, and concerning the ability to reduce the risk of biological damage to cellular DNA which may arise by contravening the mobile phone manufacturers’ advice to keep mobile phones away from the body during a call. The Skudo®Wave product has been certified in 2009 by the ‘Institute for Research and Testing “M. Masini ” in Rho (Milan – Italy) when the brand that identified the product was only Skudo® (Ref / Ref No. CONCMARK 001/2009 OF 27/02/2009) and, more recently, the product has been tested and certified by CSI, the IMQ group specifically on the capabilities to modify the vibrational bands of a mobile phone (Rif/Ref n. C0189\FPM\MATs\16_1 of 30/03/2016). The process of production and the brand SKUDO®WAVE ARE PATENTED. The Skudo® brand and been internationally patented by the product’s inventor, prof. Nicola Limardo and his manufacturing company EDIL NATURE SRL. The basic brand “Skudo®” protect also similar brands like Skudo®Wave as required by international rules on trademarks and patents. Even the production process has been patented and certified at European level (European Patent No. 2,073,611) by the inventor and manufacturer of Skudo®Wave. Has been demonstrated that cell phone causes a modify or a damage to DNA? – Nora Volkow’s study published in the Journal of the American Medical Association (Jama) in 2011 showed that exposure to cell alter glucose metabolism in the brain. You can see it very well in the PET image which compared the brain reaction near a phone switch on and a phone switch off. Our findings show that the brain is sensitive to the radio frequency electromagnetic fields due to the massive use of mobile phones. We do not yet know the results of this change, but we know that the provoke cause is the phone and no one from now on will ever argue otherwise. 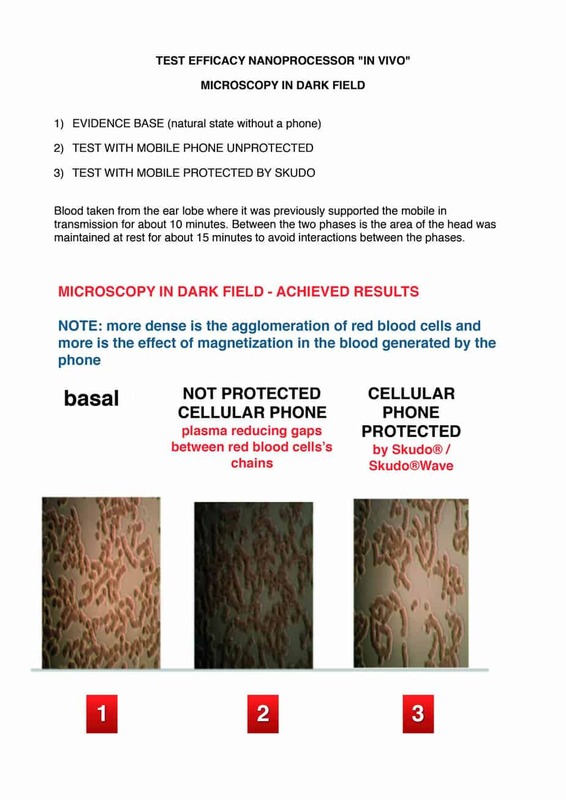 Using the same basic conditions published by JAMA, but with cell phone protected with nanoprocessor SKUDO, was made in Italy PET (Positron Emission Tomography) to test “in vivo” the efficacy of nanoprocessor Skudo® and the result was : Homogenous consumption of FDG in the brain (ok glucose). – Morphological blood test: MICROSCOPY IN DARK FIELD: Blood taken from the ear lobe where it was previously supported the mobile in transmission for about 10 minutes. Between the two phases is the area of the head was maintained at rest for about 15 minutes to avoid interactions between the phases. – Swedish scientists Lennart Hardell of University Hospital in Orebro and Kjell Hansson Mild of Umea University, have demonstrated and published on ‘Occupational Environmental Medicine that those who use mobile phones for more than 10 years for about an hour a day, increase 20% the possibility to develop glioma (cancer) and 30% the possibility to develop the acoustic neuroma. – Henry Lai, Electromagnetic Research Laboratory, Department of Bioengineering, School of Medicine and College of Engineering, University of Washington, Seattle, Washington, USA and Singh, 1995, 1996, 1997 declare: we have reported an increase of breaks in the single and double DNA filaments, two forms of damages to DNA in rats‘s brain cells after their exposure to radio frequency radiation. – New York, Friday, May 27, 2016: an important two years study of the US National Toxicology Program states that ‘exposure to typical cellular radio frequency increases the cases of cancer in male rats. The increases, small but statistically significant, concerned specifically glioma, a type of brain cancer, and Schwannomas, the same found from some epidemiological studies on humans. The study, which cost $ 25 million, was conducted on more than 2,500 rats and mice exposed to various amounts of radio frequency in 21 rooms specially designed . The decision to publish the preliminary results of the study on rats came after the microwave.com site had anticipated the results, while the full report, which has been checked and verified by independent authorities, will be published next year. “The study found a low incidence of malignant gliomas in the brain and schwannomas in the heart of exposed male rats – write the experts -. Because of the widespread use from all ages of mobile communication technologies, even a small increase that will result from exposure could have important implications in public health”. – tests performed on Jurkat cells exposed to the electromagnetic field of mobile phone in the Laboratory of Genetic Toxicology, University of Perugia, showed genotoxic effects that cause discontinuities in the phosphodiester skeleton; in particular such discontinuities may result from rupture to a single-and double-stranded of DNA. The biological damaging effect to the cell is sure? Why is it important to act on biological damage? The biological damage is the antechamber of health damage, that is the disease. It is not certain that the biological damage will turn to disease, but it is certain that if there is no biological damage there can not be any disease. It is therefore important to reduce it drastically. What does the International Agency for Research on Cancer (IARC) say? Why products like Skudo®wave are sometimes seen as useless? Who says it falls in general, wrong because it confuses Skudo®Wave with “shielding devices“. SKUDO®WAVE DOES NOT REDUCE THE ELECTROMAGNETIC FIELD. It’s important to note that Skudo®Wave doesn’t shield the phone and therefore does not interfere with the performance of the device on which it is applied; as if it were acting as a shielding product, the possible harm caused by the phone’s battery would be even greater because the phone should continually seek to connect to new “cells” of repeaters, with a consequent increase of the excitation of the battery and therefore of the vibrational components of the materia the phone is made up of. Skudo®Wave, however, does not weaken the cell phone signal and it doesn’t emit any electromagnetic fields. Is it a shielding device? It’s important to note that Skudo®Wave doesn’t shield the phone and therefore does not interfere with the performance of the device on which it is applied; as if it were acting as a shielding product, the possible harm caused by the phone would be even greater because the phone should continually seek to connect to new “cells” of repeaters, with a consequent increase of the excitation of the battery and therefore of the vibrational components of the materia the phone is made up of. Skudo®Wave, however, does not weaken the cell phone signal and it doesn’t emit any electromagnetic fields. According to the ISS (National Health Italian Institute) “Many devices that claim to reduce the exposures due to cell phones are available in the market. The tests carried out show that generally they do not work as advertised. The so-called “shields” usually interfere with the proper operation of the phone, forcing it to increase the power used, causing an increased exposure – rather than a reduction”. Is there a court case about the connection between Cancer and mobile phone? On October 12, 2012, the Italian Supreme Court, namely the “Corte di Cassazione” (3rd level of judgment), confirmed a previous decision by the Civil Court of Appeals of Brescia (Decision December 22, 2009, no. 614) that ruled that the National Institute for Workmen’s Compensation (INAIL) must compensate worker Innocente who developed a tumor in the head due to long-term, heavy use of mobile phones while on the job. The decision of the Supreme Court appears to view the correlation between mobile phone exposure and the development of a head tumor as probable, for legal issues. Such a decision is supported by a consistent body of evidence on the link between mobile phone microwave exposure and head tumor onset, presented by L. Hardell and coll. (1999 – 2012), the INTERPHONE study (Int J Epidemiol 39, 2010) 1, and a study by S. Lönn, A. Ahlbom, P . Hall and M. Feychting (Epidemiology, 15:653, 2004) relating to benign tumors of the acoustic nerve2. All of these studies and more represent a scientific basis for the May 2011 IARC classification (2B) of radiofrequency as a possible carcinogen. Skudo®wave is active only in the point where is applied? Skudo®wave affects on the atoms of the device it is directly in contact with and then, all the other atoms are immediately “formatted” by the first ones; so we have the effect of a “waterfall” transmission. That’s why, for example, when you apply Skudo®wave on a corner of your computer, immediately all the “mass” assumes its “orders”. This system is best scientifically defined “quantum waterfall”. In doing so, we are sure that the electrons in the materia of the cell phone do not become chaotic and, as far as possible, they tend to be in balance with the fundamental laws of nature. On which devices can it be used? Skudo®Wave can also be used on electrical and/or electronic equipment (computer, mouse, Wi-Fi systems, modems, tablet, bluetooth headsets, kitchen appliances, etc.) that emit low electromagnetic fields – middle entities (up to 0,2 microTesla of magnetic induction, and up to 100 V/m of electric field). Skudo®Wave can be applied as you will on the phone (front or back is indifferent) or on the cover (if it is a “book flip” type Skudo®Wave must be applied on the side in contact with the mobile phone). One device is enough for each mobile. Skudo®Wave needs no maintenance or cleaning, in case it comes off, simply reattach it with any glue without the danger of loosing its effectiveness. At the end of its life cycle it can be disposed as any other solid urban waste. How long does the efficacy of Skudo®Wave last? Skudo®Wave is guaranteed for two years from the date of purchase. If i cut skudowave what do i see? Being a nanotechnology, cutting SkudoWave is not possible with naked eye to see anything. A specific spectrophotometer or one of the above methods is required.